Our rental Cabins near Linville Falls NC are located in the Pisgah National Forest amidst all the natural beauty of the Blue Ridge Mountains. The sweeping landscapes will take your breath away, and the four-season splendor of our Rental Cabins Western NC will delight you all year long. In addition to a beautiful setting, our Western NC Mountain Cabins Rentals are surrounded by countless Western North Carolina Attractions. With so many great Things to Do in Western North Carolina, you can rest assured that there will never be a dull moment during your visit to our Blue Ridge Parkway Cabins. Perfect for relaxing, and a centrally located headquarters from which to enjoy everything that this special region has to offer, our Rental Cabins Western NC are the perfect place for families, couples, and even the lone traveler. Though tourists flock to the area to experience its many commercial attractions, some of the most unforgettable Linville NC Attractions are not manmade at all. Just five miles from our Cabins in Pisgah National Forest, Linville Falls is a gorgeous attraction that you won’t want to miss. Carved by the Linville River, for which our Cabins on the Blue Ridge Parkway are named, Linville Falls NC has long been sought after by hikers of all ages. Consisting of both upper and lower falls and boasting a spectacular 45-foot drop, Linville Falls NC are accessible every day of the year via two main trails that begin at the Linville Falls Visitor Center, operated by the National Park Service. Ranging in difficulty from moderate to strenuous, beginners and experienced hikers may choose the trail that is appropriate for their skill level. Erwin’s View Trail is short 1.6 mile round trip hike that offers visitors four overlooks, each of which allows them to see Linville Falls from a new perspective. 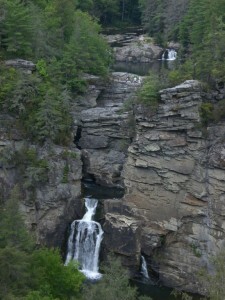 Linville Gorge and Plunge Basin are shorter but more strenuous, and might not be suitable for less experienced hikers. While taking in the beauty of Linville Falls, it is always necessary to obey signs and other indicators that have been put in place by the National Park Service to ensure visitors’ safety. The Linville NC Attractions, including Linville Falls NC, the Linville Gorge NC, and Linville Caverns NC, are a huge part of what makes Linville NC such a wonderful place to visit, and what makes our Linville Falls Lodging some of the most conveniently located in the area. All of these Western North Carolina Attractions are easily accessed from our Cabins on the Blue Ridge Parkway. Our Western NC Mountain Cabins Rentals are just five miles from Linville Falls and close to all of the other Things to Do in Western North Carolina like North Carolina Fly Fishing, Biltmore Estate North Carolina, Emerald Village, and Hiking Trails Grandfather Mountain NC. Consider staying in our Vacation Rentals in Western NC and you will be delighted with the choices you will find. Whether you plan on visiting outdoor Western North Carolina Attractions like Linville Falls and Linville Caverns NC or historic Emerald Village and Biltmore Estate Asheville, you will find that our Linville Falls Lodging is ideally situated. Planning a romantic getaway for two, a family retreat, or a Fly Fishing in NC trip with friends? Our Rental Cabins Hot Tub Western North Carolina are just the Rental Cabins Western NC you’ve been looking for! Why stay in overpriced, overly commercialized Hotels Linville NC or Linville NC Motels when you can enjoy all of the comforts of home—and close proximity to all of the fantastic Things to Do Western North Carolina—at our Western NC Cabins?